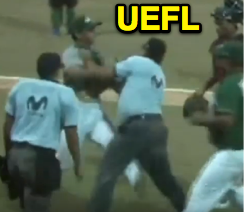 Colombian League Manager José Mosquera of Los Toros de Sincelejo attacked umpire Johan Prochorón after being ejected during the Colombia Béisbol championship series, repeatedly pushing the LCBP official after a ball/strike dispute didn't go his way, ultimately resulting in a team-led assault on the six-umpire officiating crew during which multiple players also physically charged the umpires. HP Umpire Johan Prochorón ejected Toros Bench Coach Jorge Cortés, Manager José Mosquera, pitcher Samuel Gervacio, and catcher Juan Camilo Zabala (balls/strikes & fighting/Unsportsmanlike-NEC) in the top of the 7th inning of the Caimanes-Toros game. With two out and one on (R3) in the top of the 7th inning, Caimanes de Barranquilla batter Christian Correa hit the 0-0 pitch from Toros pitcher Jose Ortega on a ground ball to left field, driving in baserunner R3 Audy Ciriaco from third base. Following the RBI single, Prochorón ejected Cortés from the dugout and eventually ejected Mosquera as Mosquera arrived at home plate to argue. Immediately after Prochorón signaled the ejection, Mosquera attacked the plate umpire, repeatedly pushing him. After covering home plate with dirt and throwing first base onto the infield, los Toros returned to the dugout and threw equipment, including bats, helmets, and other projectiles, onto the playing field, as the Toros' mascot (a bull) pawed at the warning track dirt and signaled toward the umpires, simulating an impending attack of his own. As the umpires waited for the ejected parties to leave the field and dugout, Prochorón ejected Gervacio from the dugout, sparking another bench-clearing incident during which Gervacio elbowed a field umpire and Zabala battered the plate umpire. As a result of the repeated attacks, the umpires left the field and suspended the game, ultimately returning to resume the championship-deciding affair some 90 minutes later, after all ejected persons had left the field. At the time of the ejections, los Caimanes were leading, 8-3. Los Caimanes ultimately won the contest, 13-4, thus clinching Colombian league title.